Good morning everyone! Happy Sunday! I’ve had a crazy busy week, between work, a college assignment deadline and meeting up with people I have been so busy. Going to a friends for a boozy Sunday brunch today and then tonight I’m putting my feet up and watching about 5 new episode of House of Cards, love that show! I thought I’d give you a little look at some of my outfits this week. I also have them posted on Instagram and Facebook. They’re really simple looks and so easy to throw together. On Tuesday I wore a simple outfit for work, but I’d honestly wear it any day of the week. It was so comfortable and easy to wear. 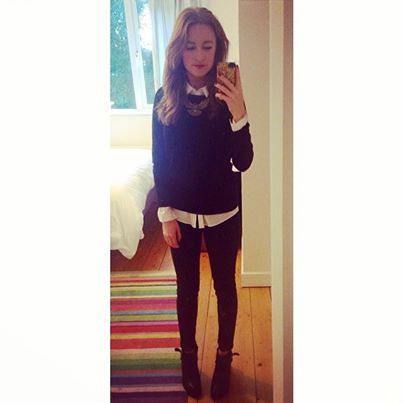 I wore my black Topshop jeans and boots, a simple white Cos shirt and my new Zara black sweater. To stop the outfit from being a bit too plain, I put on my Topshop eagle necklace and some Mac ‘Lady Danger’ lipstick. Wednesday, I was going to college after work that night to finish an assignment and wanted to be comfortable. I love how I can be super casual in work, makes life so much easier. I wore this red plain shirt I got in Topshop about 5 years ago. I got it a couple of sizes too big because I like shirts to be loose. Then my white Topshop jeans with boots and my gold Asos watch. Make up was kept super simple. Then yesterday, I was going into town to watch the rugby match with some of the girls. I wore the Zara jumper from earlier in the week again with my new Zara green leather skirt. I absolutely love this skirt. Super soft, dips slightly in the front and back and it’s high waisted. I feel I’m going to be wearing it a lot in the future! So there is some of my outfits for the week. I’m off to get ready for today with my girls. Can’t wait for a catch up! I’ll have the Milan Fashion Week round up for you guys soon so keep an eye out for that. Nice casual looks… I especially like the green leather skirt… Do they not look tacky at all in person? More of a question rather than a comment :)) and how much did you get them for? Thank you! I actually find that leather skirts from Zara have a great finish. The green leather skirt is super soft and doesn’t have any shine which I think can make fake leather look tacky like you said. I think it was only €29.95 so it was amazing value! I hope that helps! Aw thanks! Those compilations are hard work so means a lot that you liked it!